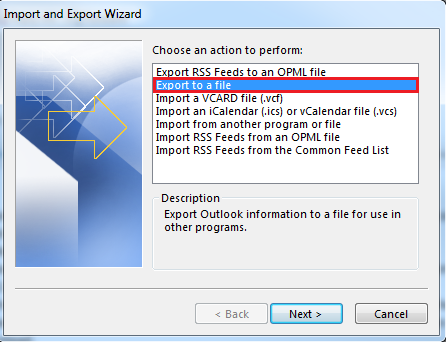 Click "Outlook 2010, 2013, or 2016"
Click "Import from another program or file"
2. Select Export to a file and click Next. 3. Select Comma Separated Values and click Next. 4. 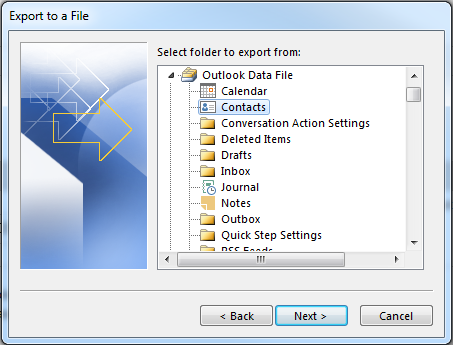 Under the Outlook Data File - Select your Contacts folder and click Next. 5. Enter the filename in the Save exported file as: field and click Next. 6. You will then see a window explaining that your Contacts will be exported. 3. Select Outlook Data File (.pst) and click Next. 4. Select your Contacts folder and click Next. Select your Contacts folder and click Next. Enter the filename in the Save exported file as: field and click Next. You will then see a window explaining that your Contacts will exported. Click Finish. Your CSV file has now been created. Open your Address Book and go to "File" and click "Import and Export"
Make sure "Contacts" is selected and click "Next"
Select a name and location to save your address book to. It is important to remember where you save it. When you are ready, click "Next"
Review the list of actions to be performed (there should usually be one action) and click "Finish" when you are ready. 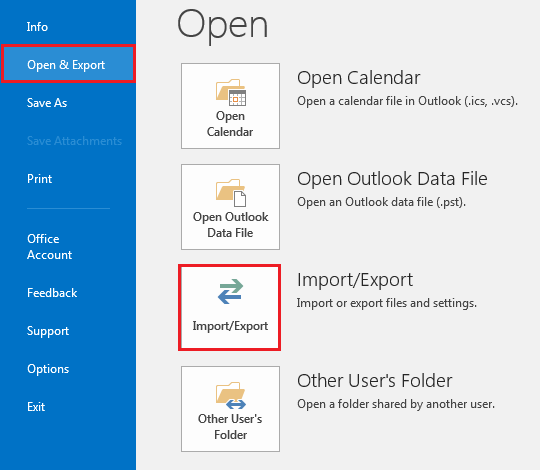 Open your address book and go to "File", "Export", and click "Address Book"
Select "Text File (Comma Separated Values)" and click "Export"
*It is important to remember where you save it. Check off the fields you wish to export. When you are ready, click "Finish"
Note: If you have multiple address books, you will need to repeat the following steps for each one. Select the address book you wish to export (e.g. "Personal Address Book" or "Collected Addresses"), and select all the entries in the address book. Click on "Tools" and click on "Export"
Type a name for your address book. It is important to remember where you save it. 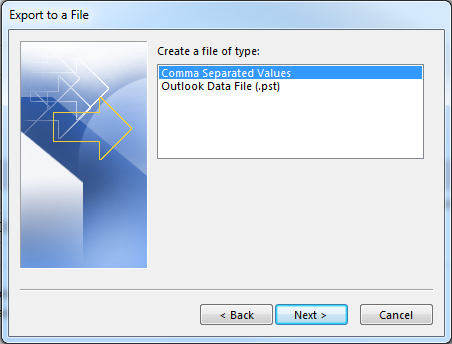 In the "Save as Type" box select the value "Comma Separated Value (*.csv)". When you are ready, click "Save"
Open the .csv file you created and rename the "Primary Email" field to "E-mail Address"
Repeat steps 2-8 for each address book you wish to export. Open the Mac Address Book and go to "File" and click "Export"
Remember where you save the file and click "Save"
Right click the file and click "Rename"
When upgrading from Outlook 2007 to 2010 or 2013, your autocomplete data is migrated automatically. If you plan to continue using Outlook 2007, follow the directions below to import your autocomplete data. When upgrading from Outlook 2007 to 2010 or 2013, your autocomplete data is migrated automatically. If you plan on continue using Outlook 2007, follow the directions below to back up your autocomplete data. NOTE: The Address Book only shows the primary department, phone and location, even if a person has multiple assignments. To view a person's full information including all their roles, use the web page search at https://www.uwo.ca/directory.html. Click Add in the Internet Accounts window. Select Directory Service from the Add menu. Type directory.uwo.ca in the Internet directory field, then click Next. Select Yes in the Check Email addresses window, then click Next. This will bring you back to the Internet accounts window. Highlight directory.uwo.ca, and click Properties. Type Western Directory in the Directory Service Account field on the General Tab. Type dc=uwo,dc=ca in the Search Base field. When in the New message window, enter the name you wish to search for in the To: or Cc: field. If there is only one match it will replace the To: field with the persons full name, however if there are multiple matches it will bring up a window where you can select the proper person. Click the Find People button. Enter the name you are searching for in the Name box. Click the Find Now button. It will open a window that shows all names that match your criteria. You can also perform more sophisticated searches and get much more information by using the web interface to the Western Directory, available at URL https://www.uwo.ca/directory.html. Searches can be made by name or unit.